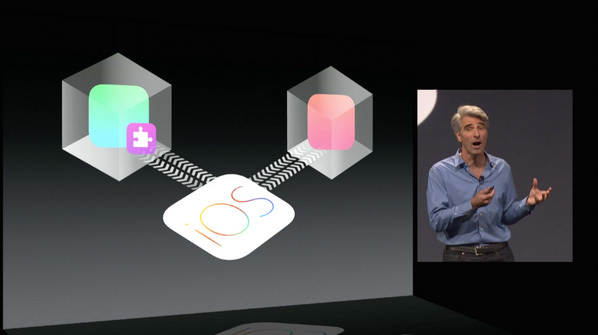 It has been 2 days since iOS 8 was revealed at Apple’s annual WWDC keynote. The 8th iteration of Apple’s mobile operating system brings the much needed features to iPhone, iPod touch and iPad. Today’s post covers our 5 favorite features of the new OS. If we are asked to single out the best feature of iOS 8 then we will certainly be choosing Continuity. This awesome feature brings harmony between iOS 8 and OS X Yosemite. Continuity allows you to do the following stuff between your Apple devices. Handoff: This functionality allows you to continue your work while you transit between your iOS and Mac devices. Let’s say you start composing an email on your iPhone and realize that the file you want to attach is on your Macbook. Now you will be able to pick up the mail draft on your MacBook where you left off it on your iPhone. Similarly you can continue browsing same web pages while you move between your Apple devices. This is a really time saving feature. Make and Answer calls: Now you can make and answer calls right from your Mac or iPad via your iPhone’s cellular network. This saves a lot of time particularly when your iPhone is on charging or is in the other room. So no need to rush towards to iPhone until you’re on your Mac or iPad. On Mac and iPad incoming calls will display the caller’s name, picture, giving you the option to accept/reject call, or respond with a quick message. 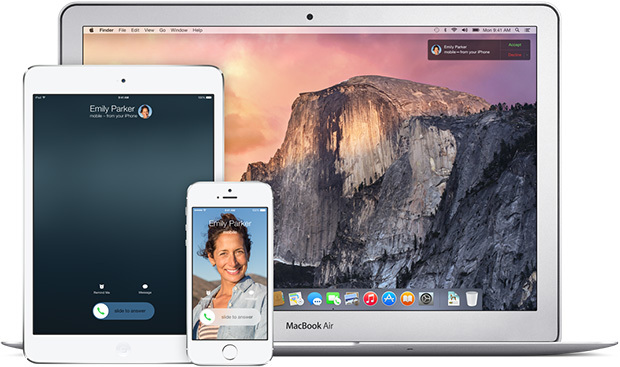 Unified Messaging: Similar to calls, you can also be send SMS and MMS from your iPad or Mac. This makes it convenient to reply to all your Messages from any device that is near you without switching to iPhone. Note: All these Continuity features require your iPhone, iPad and Mac to be on the same Wi-Fi network. With the addition of quick reply, Notifications are more interactive than ever. Now you can quickly reply to any notification via the Notification banner. All you have to do is swipe down the Notification banner and a text box will appear, write/record your message and tap the send button. You can also use this feature from the lockscreen of your iOS device. iOS users were asking for the widgets since the very beginning. Finally, Apple has added the support of 3rd party widgets to iOS 8. You can access and manage all your widgets from Notification Center. This is a really useful addition, and possibilities can go beyond your thinking once developers started building widgets for your iOS devices. iOS 8 brings the major changes to the keyboard since version 1.0. QuickType is the new predictive system for the keyboard of your iOS device. It shows you perfect suggestions for your next words in a conversation, mail composing, text editing etc. 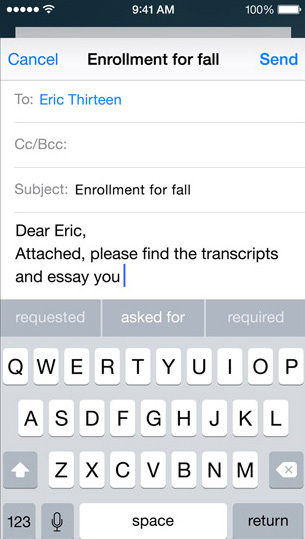 QuickType takes care of your casual and formal style in text messages and Mails respectively. At the moment predictive text feature is limited to 14 countries only. Another big change to keyboard is that you can now choose 3rd party keyboards as your default system wide keyboards. This is a big news if you’re a fan of swiping rather than tapping. Extensibility is the new feature that allow developers to build apps that can provide services to other apps. For example if an app like Instagram offers extensions than we might be able to use all the nice filters of the app within the built-in Camera app. Similarly a translator app like Google translate can also offer it’s extension to be used by Safari to quickly translate the web pages. Let us know about your favorite features in the comment section below. Stay tuned for more.